While there are many issues and violations in the joint use world, there are a few we see so often we consider them problems of interest: repeat offenses to which no utility pole owner is immune. Today, we address a problem that may be number nine on our list of joint use violations, but ranks high on the tally of critical issues for utility pole owners: missing and damaged ground wires. Utility poles are exposed to wind, weather, traffic and other natural and man-made influences from car accidents to thievery. The world can be a tough place for field assets—especially parts at ground level. Ground wires are necessary safety measures designed to ground power poles, protecting property and pedestrians from dangerous power surges. 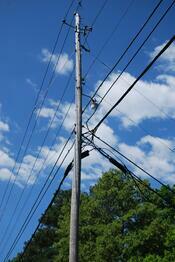 Unfortunately, they can be damaged, stolen or cut inadvertently and not replaced during routine work on a pole. Why would anyone steal a ground wire, by the way? Because some contain copper wiring—a favorite target for lawbreakers looking to make a quick buck at the scrapyard. We have covered the epidemic before, and the practice does not seem to be letting up as copper prices continue to soar. Simple diligence, including utility pole inspection, and tight maintenance practices can keep this safety hazard at bay. Replace or repair damaged ground wires as soon as they are identified. How can a company ensure that each and every pole currently in use has all its safety measures intact? Utility pole inspection can answer that all-important question, as well as a great deal of others about the health, status, and even exact location of all poles in an owner’s portfolio. Missing or severed/damaged ground wires are a massive safety issue for utility pole owners, and can be dangerous to both the public and utility workers. Without a proper grounding system, a utility pole becomes a 40-foot threat with the potential to cause power surges, property damage and fires. Human contact with live electricity can also happen with devastating results. In one case investigated in 2011, a cable technician standing at the top of a ladder well clear of electric utility power conductors and energized electrical wires evidently received a shock that took his life. An inspection revealed that the pole’s ground wire had been severed in two places, and that the top portion of the wire was hanging mid-air, about ¼ inch away from the 2,400 V conductors on the top of the pole, causing live electricity to arc to the wire. Severed at the base, the ground was useless. This same scenario could just as easily happen at street level, injuring a pedestrian, or somewhere between, causing fire and damage to property. As such, it is important for all utility workers and homeowners alike to remain aware of the condition of pole ground wires in their area. If a wire needs to be replaced, it should be done so as soon as possible. As with many joint use issues however, knowledge is power. With the information gathered via regular, thorough utility pole inspection, and/or the knowledge cataloged and organized via a joint use management system, knowing the status of ground wires on your poles can be as easy as a click of the mouse—information that can keep your poles grounded, and your businesses grounded in good safety practice. Need help with joint use management? Discover ten must-have features that effective, efficient joint management software should have.